Happy 4th of July USA today 2010 .. still crazy after all these years ..
Christina Hendricks’s “retro bombshell with brains” on Mad Men — which will be returning to the North American TV ether this coming Sunday, July 25: the best show on television anywhere in 2010. Some 60 years later, on the 4th of July, 2010, much of this Innis-Gunther judgment still rings true enough, even in a new global village where the ancient spectacular civilizations of China and India are taking out new leases on life. What about the United States? 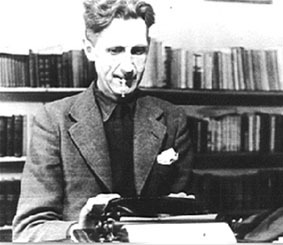 In 1947 Orwell felt that: “In North America the masses are contented with capitalism, and one cannot tell what turn they will take when capitalism begins to collapse.” Observers of the recent G20 meeting in 2010 might be pardoned for thinking that Europe and America have recently switched sides. The Europe of Berlusconi, Cameron, Merkel, and Sarkozy appears at any rate slightly more mindlessly “capitalist” than the America of Barack Obama (if not the Mexico of Felipe Calderon or the Canada of Stephen Harper). Some will want to link this to the recent Gallup poll finding that: “One in three Americans (32%) now say they are ‘extremely patriotic,’ up from 26% in 2005 and 19% in 1999 … At least 7 in 10 Americans since 2002 have consistently said they are ‘extremely’ or ‘very’ patriotic; 74% say so this year. This is up slightly since the 1990s.” You might say: 74% are either very or extremely patriotic, and 26% “have no clue what country US fought to gain its independence.” If you add these two numbers together you get 100%. And the 26% who have no clue are just the 26% who are not either very or extremely patriotic in 2010. 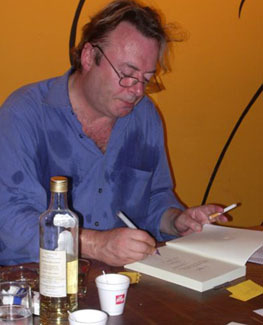 Christopher Hitchens, hard at work, promoting his books. Yet, as Canadians know deep in the pits of their stomachs, it is part of what still makes the USA today such a “dangerous … spectacular … powerful and magnificent nation” that perhaps the largest portion of the 26% who “have no clue what country US fought to gain its independence” are actually found among the 74% who are either extremely or very patriotic. 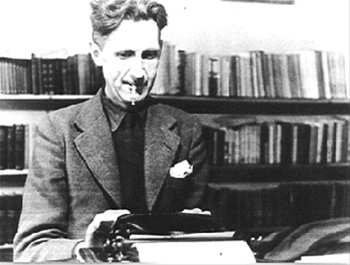 George Orwell, hard at work writing his books. 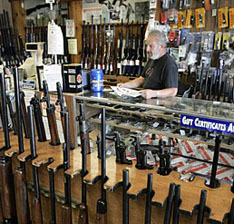 Ed Etheridge works behind a counter at Rink’s Gun and Sport in the Chicago suburb of Lockport, Ill. Frank Polich / Reuters. ieusa01 ... US fans pose for photograph as they wait for the start of the 2010 World Cup second round match between United States and Ghana at Royal Bafokeng stadium in Rustenburg, South Africa, June 26, 2010. Photograph by: Brian Snyder, REUTERS. 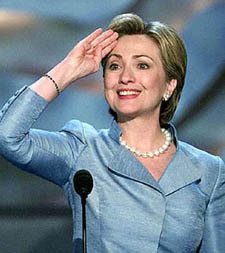 Hillary Clinton did not become president, but according to Kathleen Parker at the Washington Post in November 2008 the USA elected “Our first female president” anyway. In 2010, say whatever else you like: it is still a vast achievement of American civilization that it elected Barack Obama President of the United States of America in 2008. Kathleen Parker in the Washington Post has got herself in some trouble over her June 30, 2010 article “Obama: Our first female president.” (See, eg, her “Following up on ‘the first female president’,” dated Sunday, July 4.) And I think myself that all this kind of talk is just too clever by half. There can be no doubt Obama’s approval ratings have declined dramatically since his inauguration — from just under 70% in February 2009 to 47% today, on the Gallup reading, nation-wide. But along with his higher approval among females than males (hello Ms Parker), there is also an apparent direct relation between your age and your approval of President Obama. The younger you are, the more likely you are to approve of him. And in this and probably various other senses too, the future is on his side. Canadians will note as well that President Obama remains more popular in Canada than in the United States. He apparently quipped to Governor General Michaelle Jean, when he paid his first state visit to Ottawa some time ago, that if things got too bad for him in the United States he might have to move to Canada. 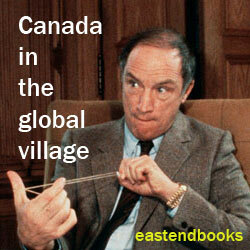 And many Canadians would no doubt be happy if he did. On the other hand, it is almost certainly the case that there is less chance of Canada’s ever actually becoming part of the United States of America in any formal sense nowadays than there has ever been before — since the birth of the United States (without Canada, despite the efforts of Benjamin Franklin and a few other emissaries) back in the late 18th century. 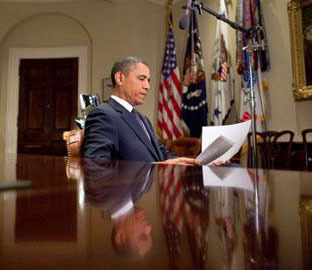 President Obama prepares to record his weekly address for July 3, 2010. Photo: White House / C. Kennedy. But by one of the strange ironies that make history so interesting, the clearer it has become that the United States and Canada are to remain forever apart, politically and constitutionally, the closer Canadians have become to Americans in almost every other way imaginable. And so it is with some warmth and enthusiasm of our own — just three days after the Canada Day on which we increasingly celebrate our Canadian independence (despite the looking-backwards appearance of Queen Elizabeth II in various parts of the true north strong and free this year) — we wish our brothers and sisters south of the still somewhat undefended and at least un-walled northern border a very happy 4th of July, 2010.